The answer is...everybody's favourite chess correspondent. Everybody's favourite chess correspondent and an expensive dinner. 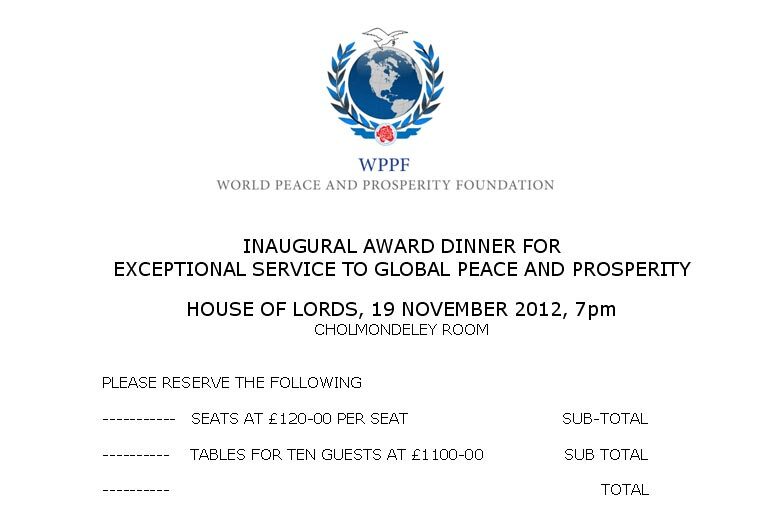 This expensive dinner is taking place next Monday at the House of Lords. It is being organised by a company of which Ray Keene is a director and it will cost more than a hundred pounds a head to attend. Why is this is a problem? Because you are not allowed to charge people to attend a function at the House of Lords. 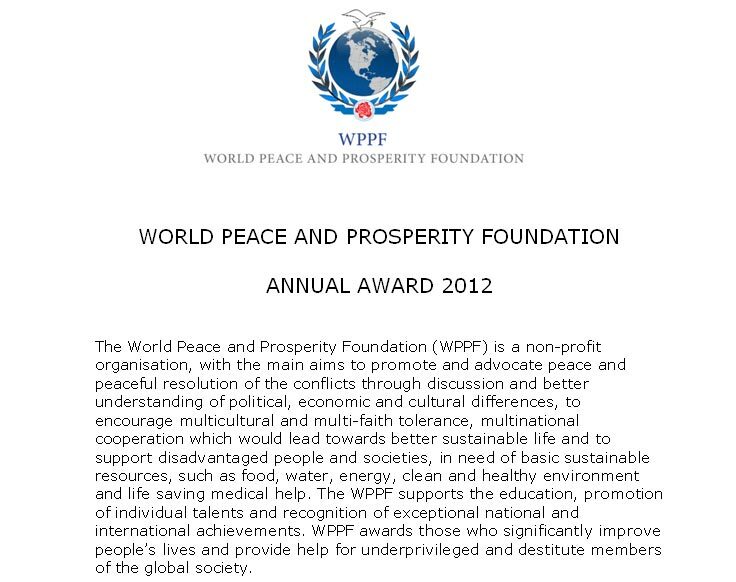 What is the World Peace and Prosperity Foundation? We know who it is, because we are told at the end of the document. Raymond Keene OBE is, as we know, a celebrated chess writer. 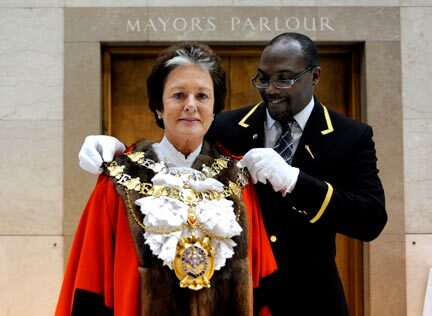 Frances Stainton is a councillor for Parsons Green and Walham ward in the London Borough of Hammersmith and Fulham and was Mayor of that Borough in the year from May 2011. Deborah Evans-Stickland sang with the Flying Lizards. Prince Mohsin Ali Khan is apparently "a leader in the fields of Finance and Business Consulting". Prince Mohsin and Ray are the directors of the foundation, which was incorporated on 24 May of this year. Its offices are at Plaza 319, 535 Kings Road, Chelsea. since that award is the subject of the reception and dinner to which we were invited. a Dr Ali Khan (no relation, they told me, to the Prince). They also informed me that the WPPF was not a registered charity. The relevance of this will become apparent below. British Diplomatic Forum is our associate member and co-operator in this Annual Award. 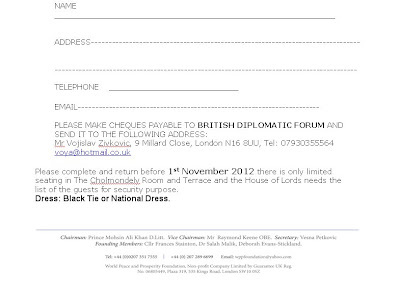 This is important to know, since if you'd wanted to attend the reception and dinner, not only would you have had had to stump up one hundred and twenty nicker, but you'd have had to send your cheque, not to the World Peace And Prosperity Foundation, but to the aforementioned British Diplomatic Forum. So says our third document, Application Form WPPF.dot, reproduced below. and the address for your chunky cheque was 9 Millard Close, N16 8UU, which is in, I believe, Stoke Newington. In order to hold a function at the House of Lords, the event has to be sponsored by a member of that House. In this case, the sponsoring member is, according to the first of our documents above, "The Lord Ryder of Wensum", or indeed The Right Honorable Lord Ryder of Wensum, whose CV includes a wide and impressive variety of high-level posts, including fourteen years as MP for Mid Norfolk, during some of which time he served as Government Chief Whip. 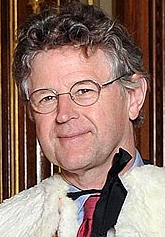 He was subsequently Vice-Chairman of the BBC from 2002 to 2004. 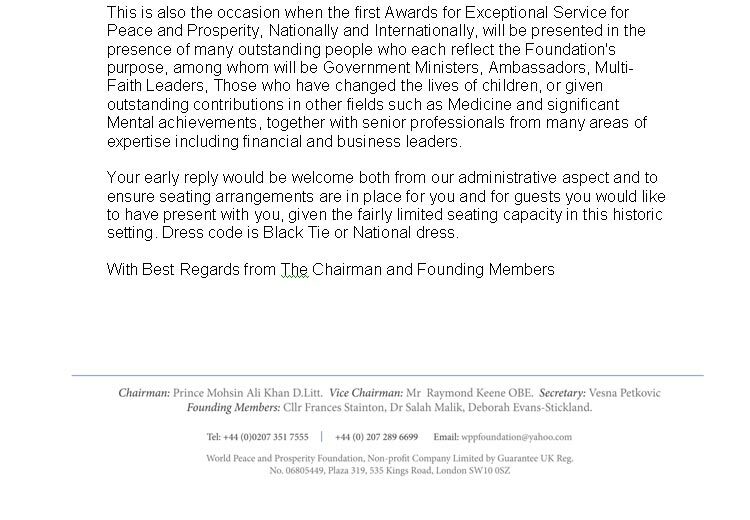 Just to check that Lord Ryder was playing host to this function, I sent him an email, headed For the attention of Lord Ryder of Wensum, to the email address contactholmember@parliament.uk as advised on the Parliament website. However, when I received a reply it came not from Lord Ryder, nor from his staff, nor from anybody at the House of Lords. 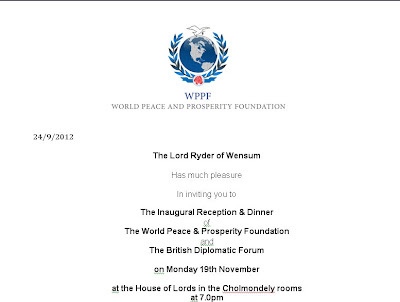 It came from Vesna Petkovic at wppfoundation@yahoo.com and assured me that "Lord Ryder is indeed the sponsor of the WPPF function at the House of Lords". This can't be right. If you send an enquiry to a Member of the House of Lords, surely they shouldn't subcontract the job of replying to a private individual at a business address? Even if they misunderstand, and think it's a business enquiry, they still shouldn't. It's not appropriate. Odd. But that wasn't the only oddity relating to the event. 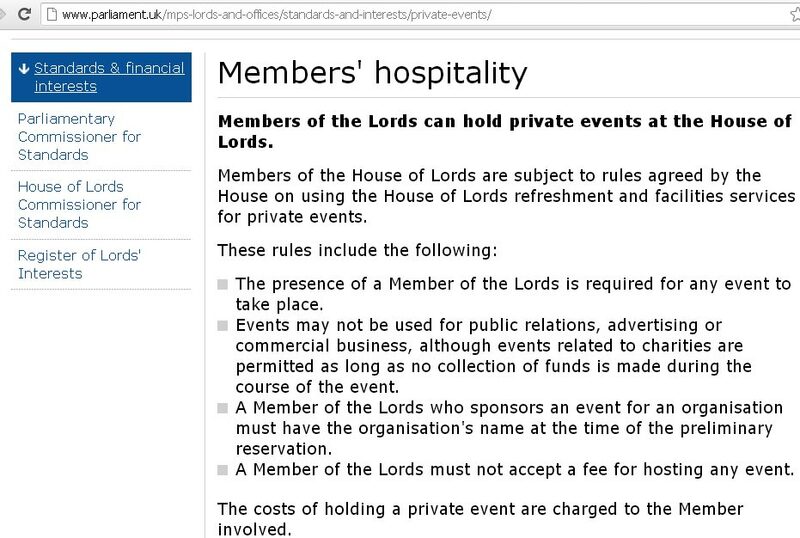 The oddest thing is that the rules seem to state that you are not allowed to charge people to attend a function at the House of Lords. As it happens I've never been to a function at the House of Lords, so I had to do a little research into the rules governing such events, in which endeavour the House of Lords Information Office were extremely helpful. Let's begin with the Code of Conduct for Members of the House of Lords, which was last updated in November 2011 and together with a Guide to the Code of Conduct is available here. 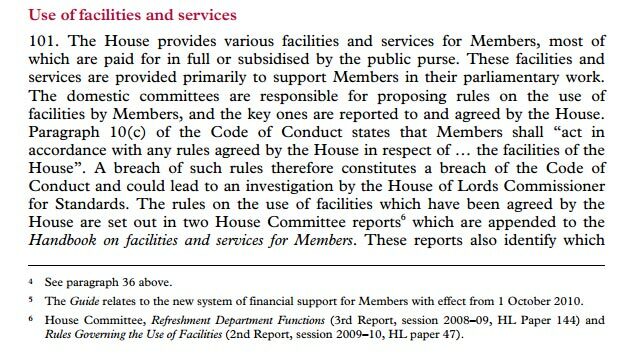 On page 21, under the heading Use of facilities and services we find point 101. The footnote refers us to Refreshment Department Functions (3rd Report, session 2008–09, HL Paper 144) and Rules Governing the Use of Facilities (2nd Report, session 2009–10, HL paper 47). This is HL Paper 144 and this is HL Paper 47. On page 4 of HL Paper 144 we read the following. (1) Subject to the exclusions in (2), functions are not to be used for the purposes of direct or indirect financial or material gain by a sponsoring Member, political party, or any other person or outside organisation. (2) It is acceptable for registered charities to use functions for the purposes of indirect financial or material gain, but it is not acceptable for them to ask attendees directly for financial or other kinds of support. The sponsoring Member must provide the registered charity number on the booking form. 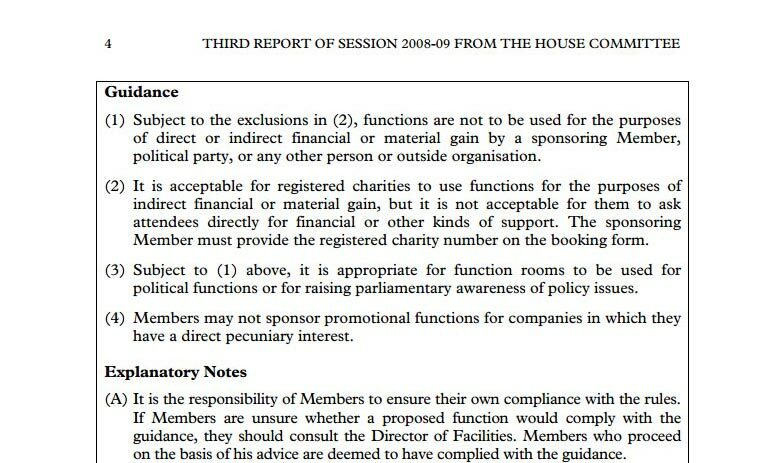 In addition to the rules put forward by the three domestic committees, we propose three further rules: one clarifying the appropriateness of raising money by hosting meals in House of Lords outlets; one on the allocation of security passes; and one restating the existing restrictions on Members' entitlement to Parliamentary papers. Finally, Members will recall that the House has already agreed new rules on holding functions in the House of Lords. 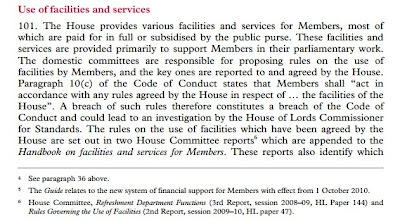 Members may raise money for charity by hosting meals in the House of Lords' refreshment outlets, but not for any other cause. 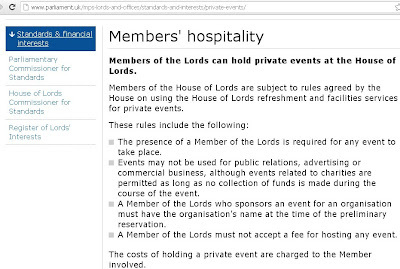 There is also a short section dealing with Members' Hospitality on the UK Parliament website. Note: The costs of holding a private event are charged to the Member involved. A lot of material! But if you wade through it, it doesn't seem to leave much room for organisations charging people to attend functions at the House of Lords. Especially where those organisations are not charities. 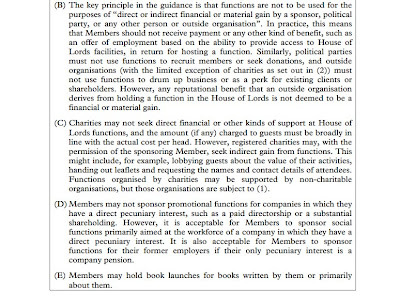 What I am trying to determine is whether an organisation, a private company, is allowed to hire the Cholmondeley rooms at the House of Lords, for a function, and charge people to attend that function, if that organisation is not a registered charity. "The costs of holding a private event are charged to the Member involved." 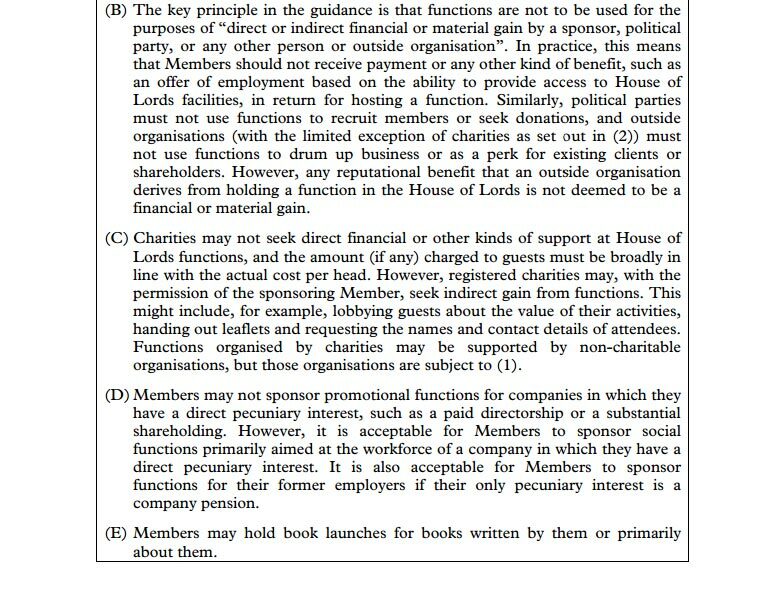 Meanwhile House of Lords Paper 144 says that "The key principle in the guidance is that functions are not to be used for the purposes of "direct or indirect financial or material gain by a sponsor, political party, or any other person or outside organisation". It makes an exception for registered charities. Therefore it seems to me that if a private company hires the Cholmondeley Rooms for a function and charges attendees, then as the costs are charged to the sponsoring Member, the company must be making a financial gain in doing so. Is this correct, or am I missing something? To clarify: no organisation is allowed to hire the Cholmondeley Room for a function and charge people to attend that function. All events have to be hosted by a Member or an Officer of the House and it is only registered charities that may, in a constrained way, pass on the cost of food to raise charitable funds. Surely that's clear. Nobody should be charging people to attend this dinner. This just shouldn't be happening. Full stop. This would be true even if the World Peace and Prosperity Foundation were a charity. But it isn't - and doesn't claim to be. 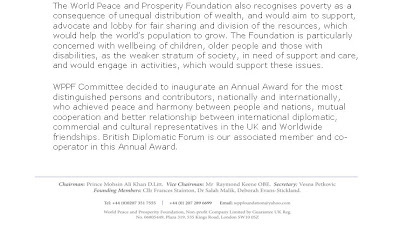 Neither the WPPF, nor the British Diplomatic Forum - to which body, you'll remember, monies are to be paid - is registered as a charity, according to the website of the Charity Commission and of course according to the WPPF themselves, when speaking to me. Nor is it a Community Interest Company, as I was able to confirm by phoning Companies House. There is no "registered charity number" that could be provided by the sponsoring Member on the booking form. 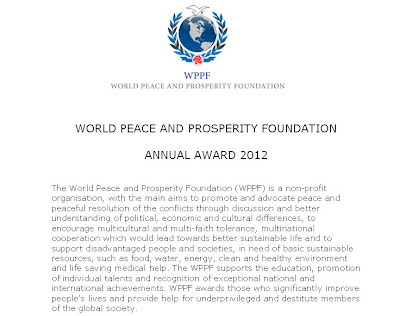 Looking at the footer on the WPPF documents, we can see that it is described as a "Non-profit Company", but this does not constitute a charity. We can see that there is a "UK Reg No." listed, that number being 06805449. This, too, is most odd. The company number of the WPPF is 08082312 and the only company I can find using 06805449 is a now-dissolved company called Dorset Estate Limited. Its sole director was a Rashid Rehman of Ilford who I have no reason to believe is connected to the WPPF. 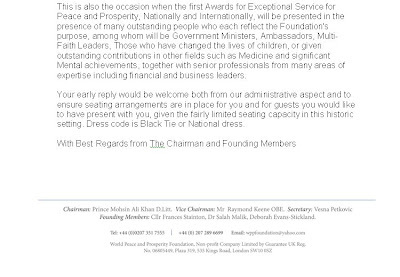 So we have a recently-formed company, but not a charity, sending letters with an incorrect company number attached, inviting people to a dinner at one of the Houses of Parliament, for which it is charging - although it is not supposed to do so. What's all this about? to maximise the ability of each and every individual to unlock and deploy the vast capacity of his or her Brain. "intensive work in deprived inner-city schools to help raise the level of mental literacy, pupils' concentration on academic work and thus behaviour and overall scholastic performance"
"mass public mental literacy courses for schoolchildren in Soweto South Africa"
"£1000 worth of books to the players in the annual Oxford v Cambridge chess match as part of World Book Day 3 March 2011". The registered address of the Brain Trust is the Clapham Common home of Ray Keene. Its Trustees consist of Ray's son, his sister, two of his old friends and his long-term associate Tony Buzan (whose Twitter contains more entertaining nonsense than any other account I know). It also claims Garry Kasparov as a member and boasts twenty-five Vice Presidents, including David Wilkie, Anton Mosimann, Sir Patrick Moore, the Marquess of Bath and Rikki Hunt. When it's not researching elephantine memories or handing out free books at the Varsity Match, what does it do? It organises the Brain of the Year Award. You've not heard of it? 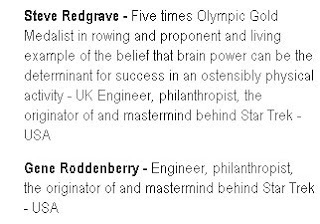 That surprises me, since the list of previous winners includes Garry Kasparov (again) as well as Ted Hughes, John Glenn, Stephen Hawking and Steve Redgrave, who according to the Brain Trust site shares with Gene Roddenberry the credit for coming up with Star Trek. You'd think that such a stellar list of awardees would make this a famous and coveted prize, but despite having run for several years it is yet to catch the public imagination. Still, they soldier on and if we scroll down the Latest News page we see that in 2010, one Wang Feng of Wuhan University won the award - beating off some serious opposition in the variously talented shapes of, among others, Roger Federer, Magnus Carlsen, Gabriel Garcia Márquez, Evelyn Glennie, Nelson Mandela, Stephen Hawking (again) not to mention Old Uncle Tom Cobley and all. Who's Wang Feng? And what did Wang have that the others hadn't? He won the World Memory Championships. 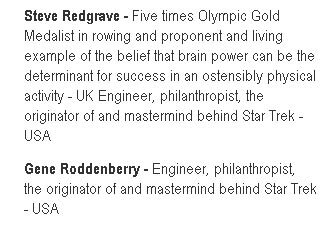 Which Championships were founded by Tony Buzan and Raymond Keene OBE. Uh huh. What about 2011? Would you believe that the winner was none other than Prince Mohsin Ali Khan of Hyderabad. The very same gentleman who is Chairman of the World Peace and Prosperity Foundation. You can see him, in the video below, receiving his award at a dinner last March at Simpson's-in-the-Strand, hosted by Ray Keene. Another of the speechmakers is Frances Stainton. "It involves eating quite a lot and drinking quite a lot"
It is not, I think, evident from the Prince's speech quite how he merited the award. Now personally, looking at this, I'm seeing less a charity and more a networking organisation with a very small sideline in charitable works. You have a prize, we hold a formal dinner, you have a long list of guests. You have opportunities for the promotion of oneself, one's events, one's companies and one's books. 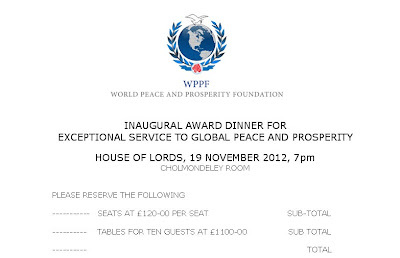 This all looks very much like the World Peace and Prosperity Foundation and their dinner. Which is fine, up to a point - if people want to hold expensive dinners and make up prizes to hand out, who cares? Nobody - until they start holding those dinners in Parliament. Where, in my view they should not be. And until they start charging people to attend them. Which they should not do. The House of Lords is a House of Parliament. It is not supposed to be there for people to hold networking functions and charge people to attend. It is not Simpson's-in-the-Strand. It is not a private dining club. Parliament is to be taken seriously. 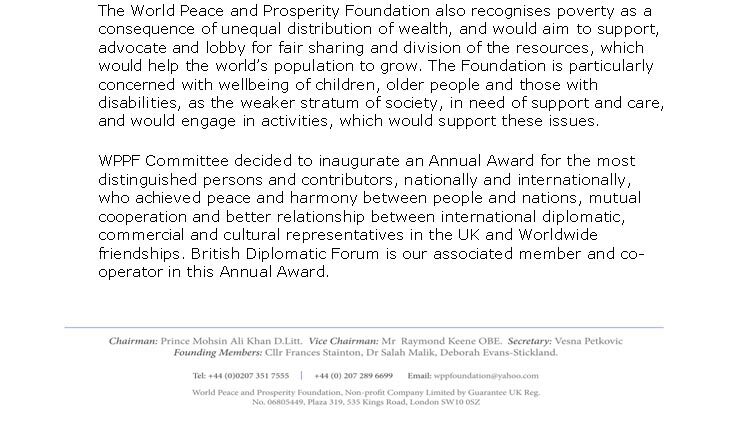 That may be more than one can say for the World Peace and Prosperity Foundation. But what of the British Diplomatic Forum? What is it? It is not a registered charity. It is not a registered company. It doesn't even seem to be an organisation, as such, at all. However, it certainly hosted a similar event last year, which was registered in the list of Banqueting events held at the House of Lords in the last quarter of 2011. It was sponsored by the Lord Stevenson of Coddenham. You can see photos from the event on the Photo Gallery (where it is, I think, wrongly dated) of NetLaw Media, whose Managing Director, Frances Anderson, was one of the speakers at the Brain Trust Dinner in March. Here's Ray at the event. And here's Ray with Mohsin Ali Khan, who was apparently Chairman. Here's a slide show for the evening (or see these minatures). NetLaw have a networking organisation - the Partners Club - which also organised a London event last February, at which Prince Mohsin gave the key address. Can you pick out Ray? Course you can. And by this time, you ought to be able to pick out Frances Stainton. I called Voya Zivkovic in Stoke Newington to ask what the British Diplomatic Forum was and he referred me to Frances Stainton. So I called Councillor Stainton to ask. She described it as "the bank account we use". A bank account. Another oddity. I've received a few invitationsin my life, but I've never before seen one from a bank account. But it seems a bank account is "our associate member and co-operator" at next Monday's dinner. 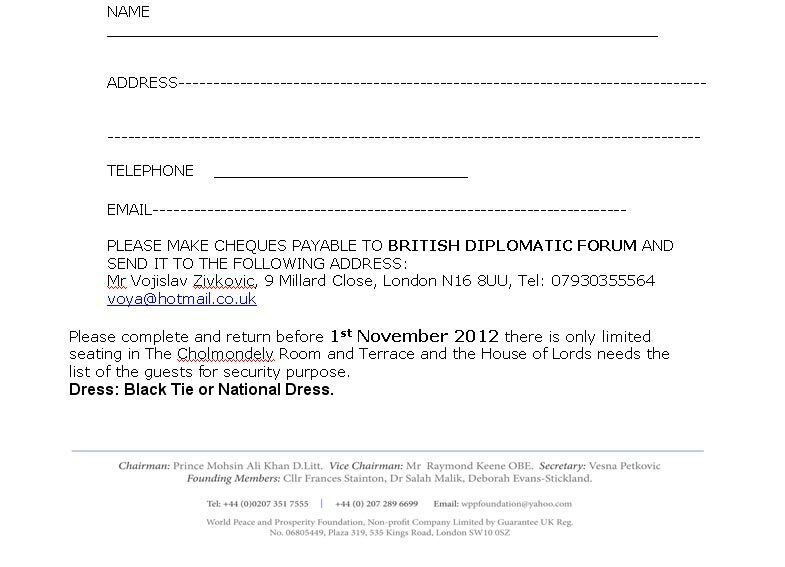 It seems a bank account hosted the event sponsored by Lord Coddenham at the House of Lords last year. Let's see that clarification again. No organisation is allowed to hire the Cholmondeley Room for a function and charge people to attend that function. 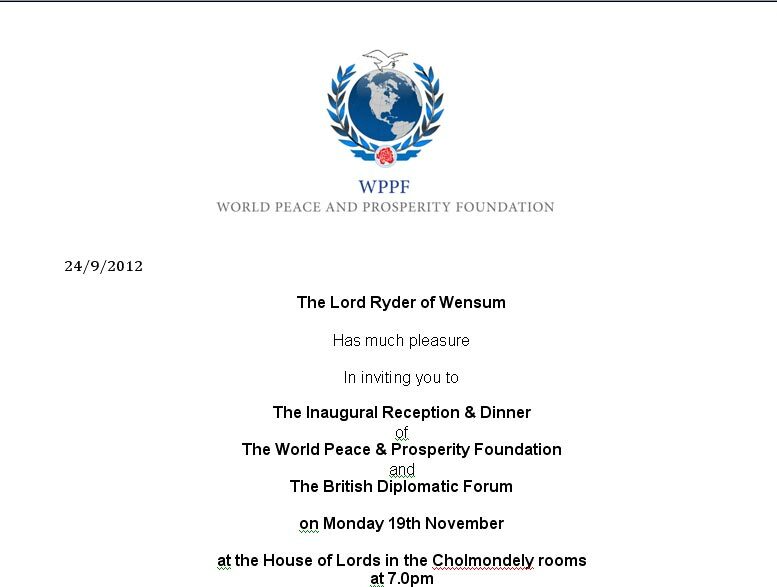 As far as I can see, the World Peace and Prosperity Organisation - directors Prince Mohsin Ali Khan of Hyderabad and Mr Raymond Keene OBE of the Times and the Spectator - is hiring the Cholmondeley Room, in the Houses of Parliament, for a function and charging people, through the British Diplomatic Forum, to attend that function. Which "no organisation is allowed" to do. It would be very interesting to hear the explanations of the people involved. Do you plan to write to the House of Lords Commissioner for Standards? Jacques: I don't, no, though anybody else may if they see fit. There's two reasons. the specific allegation should be made to the Commissioner in private and not publicised until the complaint has been finally determined. Hence, having publicised it, I cannot proceed in this way. I chose not to, because although 107 says it's in the interests of natural justice - a view to which it is entitled - I find that a little too cosy. You wouldn't get that protection in a court of law, and I don't think it's appropriate to political representatives. The second reason is that I think that this sort of thing is wrong, ethically, even if the Commissioner should deem it aceptable. I don't believe the public would be wholly comfortable with the Houses of Parliament being used in this way, and while the public may think a lot of things that are not entirely fair, I think that on this occasion they would probably be right. A Member of the Lords must not accept a fee for hosting any event. The costs of holding a private event are charged to the Member involved. It's probably deliberately worded in an ambiguous manner, but does this allow or disallow the Member to receive the bill for the reception or dinner and then pass it on without addition to the body being hosted? Did the hosting Lords really pay for all of that out of their own pockets? So is there really a story here at all, apart from "you know who" upgrading his dining experience from Simpsons to the HoL? Yes, and obviously so: it lies in (among other things) the fact that people are being charged, when this apears to be out of order, and the question of whether this sort of thing is what Parliament it actually for. does this allow or disallow the Member to receive the bill for the reception or dinner and then pass it on without addition to the body being hosted? are interesting (and did of course occur to me) but surely the point is: if they allow this, why is this not transparent? Things shouldn't be "worded in an ambiguous manner". Who does that benefit? While the Commissioner might disapprove of complaints being publicised before he has investigated, I doubt that he would regard the publicity as relieving him of the need to investigate. "Natural justice" is a legal concept which involves safeguards like impartiality and giving the accused a fair hearing: it has nothing to do with the avoidance of publicity. I agree that this "rule" is an excessively cosy one, but I think it's unenforceable anyway. It's possible, of course, that the Commissioner might think what has been done here is acceptable - though, if I've understood the matter correctly, it's hard to see on what basis he might reach that conclusion. But, if you think it's unacceptable, isn't it worth trying to get something done about it? Not that the Commissioner encourages such complaints: you have to use snail mail. But you are asked to give an email address, so that his office does not have to jump through its own bureaucratic hoops. I quite like the idea of RDK getting involved in World Peace and Prosperity. Is he on record anywhere as to why he decided to tackle this area and how he proposes so to do? Lunch today with Viscount Monckton, and Lord and Lady Pearson. Planning live chess display where the pieces will be specially trained dogs. There are various stories about the rooms at the House of Lords being used for commercial purposes over the past few years and attempts to crack down on them. As far as finances are concerned, the HoL will allow the use of rooms at no cost to the peer issuing the invitations, but food and drink have to be paid for separately to the HoL catering organisation. So that would give a justification for the cost of the dinner. You can take it, Roger, that I read that story and several rather more recent ones in researching the piece. But it's not about whether the peer is profiting or not - not this story, anyway. Nor is it about the food and drink having to be paid for. 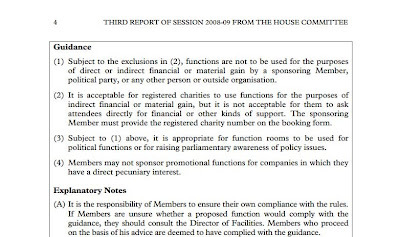 It's about the fact that when I enquired, the House of Lords Information Office said explicitly that organisations could not charge people to attend functions, and we appear to have an example of an organisation doing precisely that. Hence the question "how come?" The video might be a bit long for some tastes but Ray completists should certainly sit through it. Tony Buzan's poetry would not disgrace a Vogon, Ray turns out to be a John Berger fan - and judging by the last speaker, a lot of drinking did indeed take place. Parliament can be proud to play host to these people. Very much appreciate your research. But events like this have become so common that observance of Code of Conduct is doubtful. 2.Price tag for dinner plate £ 1-200. 3.Most of the companies which host these dinners are not non-profit organisations( Leave alone being charities). The WPPF emerges again in 2015, same actors and players, same venue and another paid award. Thank you for the article. ejh - been researching a potential fraudster that has massive connections with what you have been writing about. Any chance you would be up for sharing notes? Seems never-ending. Certainly, our email address is chesscomments@gmail.com if you want to write in total confidence.